If you are feeling a little overwhelmed by the 688 Ignite sessions on Channel 9, then check out this great article from the Exchange Team. The Exchange Team collates all the Exchange, Office 365 and Outlook content into several easy to navigate lists. In the first list, you will find 20 videos on Exchange Server. 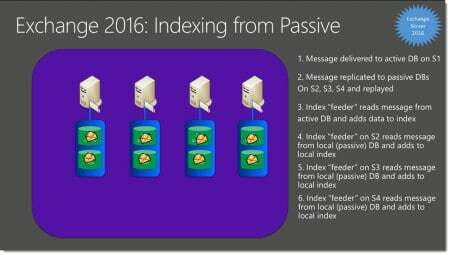 The majority of the content is focused on Exchange Server 2016. Here is what we learned about our favorite product. For a summary of the Microsoft Ignite Keynote be sure to check out this article. The biggest announcement is that you can no longer split the Client Access and Mailbox roles. While multi-role was a recommendation in Exchange 2013, this is now mandatory in Exchange 2016. Check the screenshot below from Brian Day’s session. 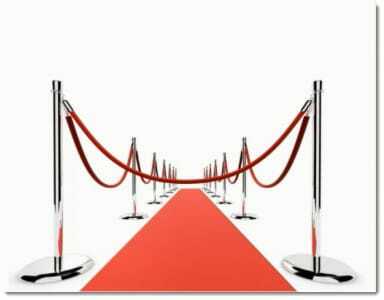 You will notice the absence of Client Access which has been rolled into the Mailbox role. You’ll also notice Edge Transport is listed as an option. Ross Smith announced that Edge will ship with Server 2016 RTM. For more information on the architectural changes, check out this post from the Exchange Team Blog. We saw the introduction of MAPI over HTTP in Exchange 2013 Service Pack 1. MAPI over HTTP provides several advances over RPC, including faster reconnection times for clients and greater visibility into errors. While disabled by default in 2013, the new protocol will come enabled as default in 2016. Further improvements have been made in 2016 for the new protocol. In 2013, MAPI over HTTP was turned on or off at the organization level. In 2016, this protocol is enabled on a per-user basis. This is great for a coexistence scenario. When Outlook discovers the availability of MAPI over HTTP the change will occur the next time Outlook is restarted. The Outlook client will continue to use RPC until it is closed. This is great for the end user. By continuing to use RPC means user won’t receive any disruptive dialog boxes regarding admin changes. Before deploying 2016, it is important you have the MAPI virtual directories configured on your load balancers. It is also important that MAPI virtual directory URLs are configured appropriately. Previously, MAPI over HTTP was only available to users running Outlook 2013 SP1. In April Microsoft extended this support to Outlook 2010. But what does this mean for 2007 users? Unfortunately, this means the end for Outlook 2007. Similarly, how Exchange 2013 dropped support for Outlook 2003, 2016 will drop support for 2007. Outlook for Mac 2008 also hit the chopping block. But this isn’t the only change in requirements. Windows Server 2012 or greater. Active Directory requirements also changed. Primarily driven by Server 2003 going end-of-life in July. Here are the new requirements. When Exchange 2013 was released it dropped coexistence support for Exchange 2003. Customers on 2003 had to migrate to either 2007 or 2010 before they could go to 2013. Similarly, Exchange 2016 drops coexistence with 2007. Organizations on 2007 will need to migrate to either 2010 or 2013 before they can jump to 2016. During coexistence, both the 2013 and 2016 Exchange Admin Center (EAC) and Exchange Management Shell (EMS) can fully manage each other’s objects. When migrating previous versions of Exchange it was always customary to place the newer server in front of all legacy servers to handle client requests. The newer edition would possess the logic of how to proxy or redirect user requests to older versions of Exchange. In Exchange 2016 this is still true. With one addition. Exchange 2013 also has the ability to up-proxy to 2016. This is great news for customers. It gives customers the choice of when they present 2016 client access services to their organization. For users migrated to 2016, 2013 will proxy those users to the 2016 servers. Check our Brian Day’s diagram for more info on up-proxy coexistence. In addition to this, you can also mix Exchange 2013 and 2016 in the same load balanced VIP. Kudos to the Exchange Team for creating such an impressive coexistence option. Should you be running Exchange 2013 in a split-role scenario 2016 lifts the requirement to maintain the 2013 CAS role. 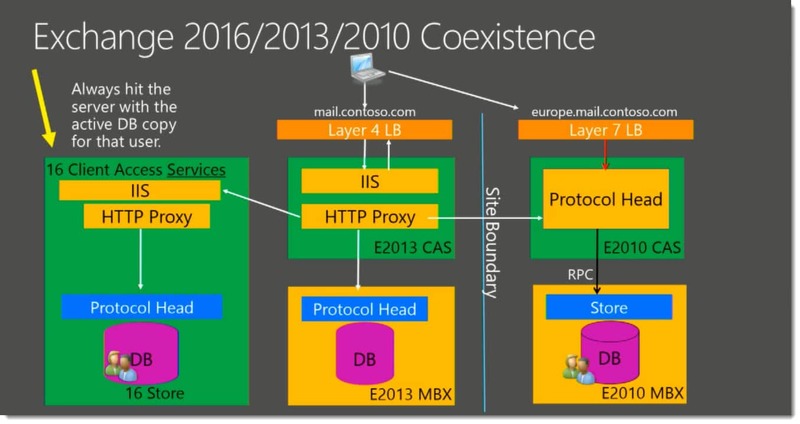 Exchange 2016 can act as the protocol head for 2013 split-role mailbox servers. First introduced in Exchange 2013 Service Pack 1, the IP-less DAG will now become the norm in 2016. This is great for Exchange admins because it vastly simplifies the creation of the DAG. The ESE team announced that IOPS have further been reduced by 22%. In fact, the team believes it has already surpassed that metric. 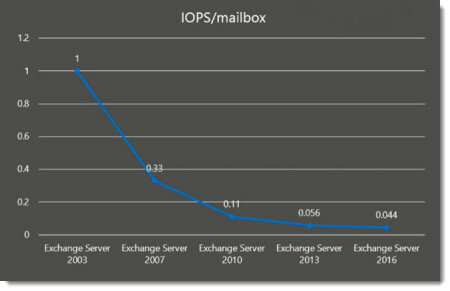 This is a 95% reduction in IOPS compared to Exchange 2003. It continues to reinforce that Exchange can easily be run on 7,200 RPM JBOD disks. Solid State Disks (SSD) or 15k RPM spindles are certainly not required. Part of this gain was increased through Workload Management, which has added disk latency monitors. 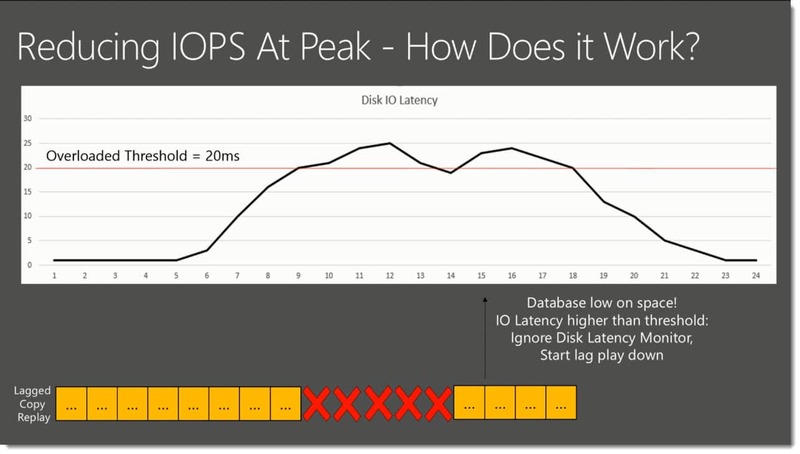 Workload Management will postpone non-critical tasks until disk latency is under 20ms. Dynamically expanding VHDX files are now supported. JetStress tests conducted by the Exchange Team reported an additional 2% overhead when using these types of disks. Older dynamically expanding VHDs will not be supported. Differencing disks continue to be unsupported. Resilient File System (ReFS) is the new recommendation for all volumes that contain databases and logs. Use of ReFS should result in less corruption, less reseeds and fewer rebuilds. It is also recommended that all disks be created as GPT versus MBR. NTFS is recommended for the volume where the Exchange install is located. The ESE team also reports that mailbox size statistics have been recalculated for a more accurate view. The ESE team reimagined the indexing process. By shifting indexing to a server’s own passive copy of the database it has reduced network utilization by ~40%. 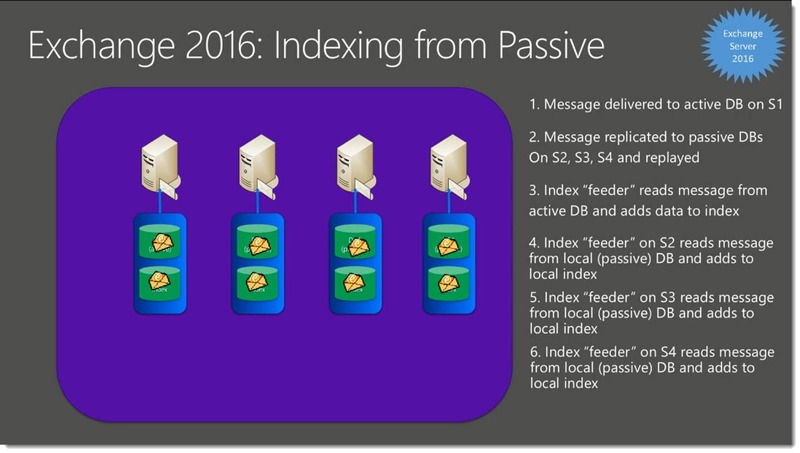 Check the slide below from the Exchange Storage for Insiders session. In prior versions of Exchange, the server that hosts an active database will ship its logs to all servers hosting passive copies. The active copy will not truncate its logs until it confirms each passive copy has successfully processed those logs. Should a passive copy be part of an outage, the server holding the active copy could get critically low on disk space. Low disk space will force a dismount on the database. Exchange 2016 introduces Loose Truncation. Loose Truncation truncates that copy. This ensures the active database stays mounted. When the passive copy comes back online it will reseed. 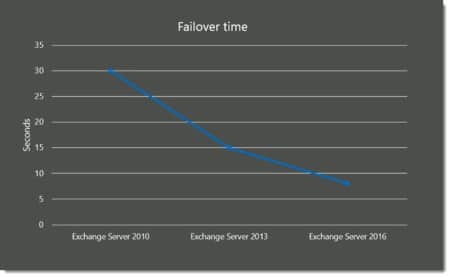 Exchange 2016 now boasts an average 8 second failover time. From the graph below (courtesy Exchange Team) you can see this time has been cut in half with each new version of Exchange. A few months ago Microsoft announced support for putting the DAG File Share Witness (FSW) into Azure. In fact, this is now the default recommendation should you not have a third data center. It is certainly more cost effective than building out a new data center. Microsoft took this one step further. 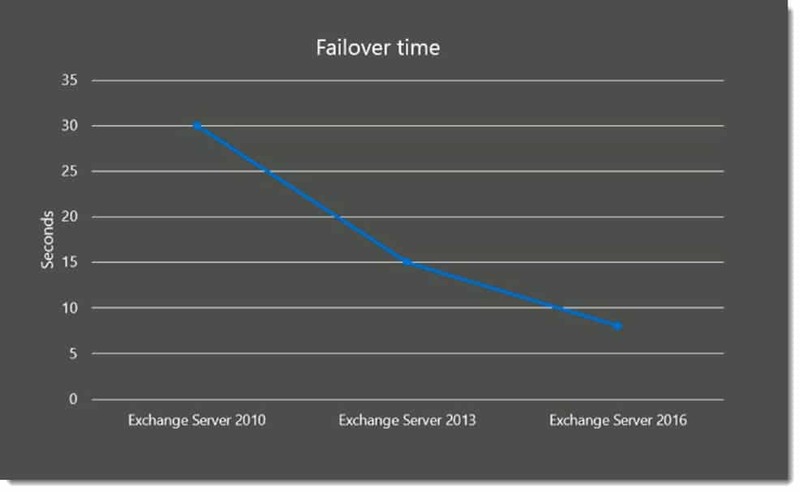 Exchange 2013 deployments are now supported in Azure for production environments. But there is a caveat. You must be using Azure Premium Storage. The other argument is cost. Exchange on-premises on physical hardware is certainly more cost effective. In fact, in a recent podcast, Jeff Guillet made a great argument. Jeff brings up a great point. Considering the costs of Exchange Online Plan 1, at $4 per user/month, putting Exchange in Azure is a hard sell to any decision maker. Jeff Mealiffe reports that Amazon AWS is not supported because they use an unsupported Hypervisor. All documentation has been updated and can be found here. With the release of Cumulative Update 8 in March, we saw the increase of up to 1 million public folders in your hierarchy. 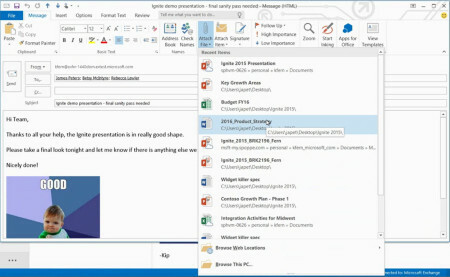 At Ignite we saw two new announcements for Public Folders. The first was that Public Folders could now be put on litigation hold for e-Discovery purposes. Second, is the recommendation that Public Folders should be placed in their own database. Ross Smith (@RossSmithIV) officially announced the death of MAPI/CDO. Ross explained that Exchange 2013 will be the last version to support the stack. Any applications utilizing MAPI/CDO, such as Blackberry Enterprise Server 5, will be blocked in 2016. Moving forward Microsoft urges all software developers to utilize the new Rest APIs. Applications that tie into Exchange Web Services are safe. Sometimes its the little things that make the biggest splash. Some of the options in the Outlook Web App are just that. The new GUI boasts an Undo button. Yep. It’s exactly what you think it is. Should the slip of a finger accidentally move an email into an unknown folder, simply click Undo. I don’t know about you but I seem to do that all the time. Another new button is Pin. Pin allows you to triage emails by pinning them. All pinned emails are automatically moved to the top of your inbox. 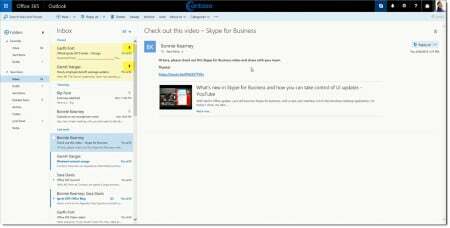 Outlook Web App also introduces Sweep. 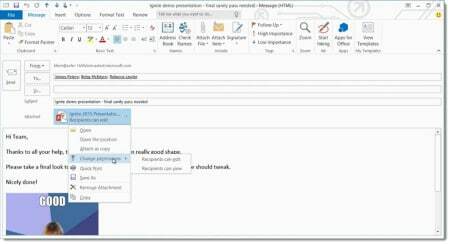 A feature that comes directly from Outlook.com. 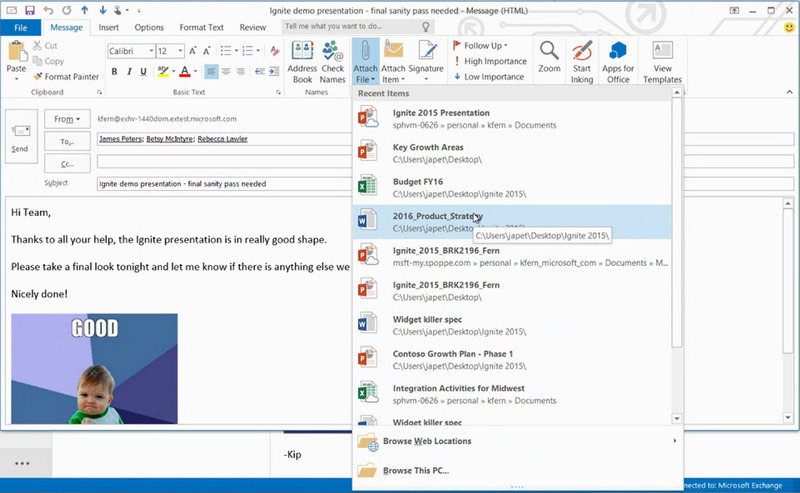 Modern attachments have been available in Office 365 for some time. But now they are also coming to on-premises. A modern attachment gives the user the option to upload their attachment rather than transmit it. To the end user, the experience is no different. It looks like a normal attachment. The only difference is the addition of a superimposed cloud icon. Hovering gives us the file location. Any file shared this way automatically gives each recipient write access. By accessing the files context menu you can quickly change this to view only. Outlook will suggest to the user that any file over 5MB be converted to a modern file attachment and uploaded instead. Should the user opt to stick with traditional file attachments and the size of the email exceeds their send limit Outlook will warn them before they send. Another great feature is the Most Recently Used (MRU) list. This list allows a user to easily find modern and traditional attachments they have sent in the past. In Ross Smith’s session, he announced the Exchange Team’s new Preferred Architecture. The architecture is a framework that Microsoft hopes every customer will follow. Large capacity 7.2k JBOD disks. Battery-backed cache controller (75% write / 25% read). RAID stripe sets (256k chunks). Exchange binaries on NTFS (64k cluster). Data volumes on ReFS (& GPT). Data volumes encrypted with BitLocker. One Layer 7 VIP per datacenter, with per service health checking. Single network for replication and client traffic. Witness Server in a 3rd datacenter (or Azure). Four copies of each database, two per datacenter. One copy is a lagged copy (lagged 7 days). Native data protection is utilized. Microsoft announced that one of its in-development work tasks was allowing for the recovery of Folders through Recover Deleted Items. No timeline has been provided as of yet. The public preview for Exchange 2016 has been announced for this summer. The final product is expected to ship in the fall or winter. If you want to get your hands on 2016 before the public you can apply to the TAP program. More info on TAP here – http://aka.ms/joinoffice. With Microsoft’s message of “Cloud first, Mobile first” one has to wonder about the future of on-premises. We are promised that on-prem products are not going anywhere. But from Satya Nadella’s keynote speech, its clear cloud is in the driver’s seat. Glad you like it. Be sure to check out the rest of our content. Thank you for spreading the word Messagingschool. It was a pleasure to write and I am glad you liked it! I attended the sessions and while informative, I didn’t care for their “preferred architecture” push. Anytime anyone asked questions, they always pushed what was “preferred” and not what is supported and customers run. I can remember in one of the ask the experts sessions someone from the audience asked how many were running their “preferred” configuration…..crickets as 5 raised their hands. Later someone asked the forgotten stepchild which they shunned repeatedly….who virtualizes Exchange?….about 80% of the room raised their hands. They push their “preferred” because it’s what they run in Exchange Online, the configuration doesn’t make sense for many organizations and the apparent push for users to Exchange Online who couldn’t run their configuration is crazy on a CAPEX level. If we keep our on-prem up all year during business hours but Exchange Online has issues every other week during business hours, it will never happen for us. 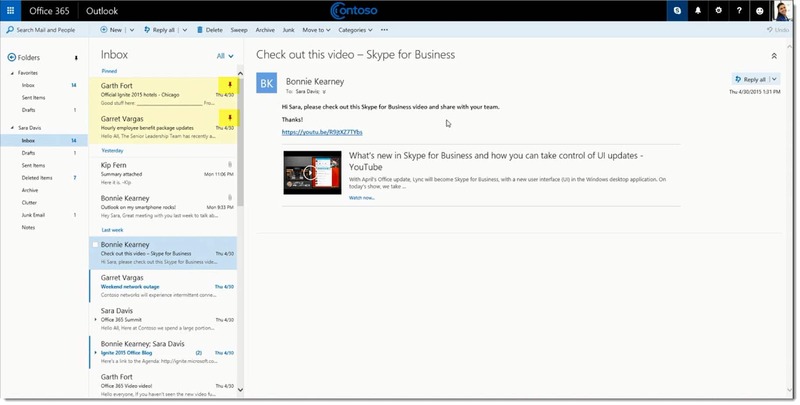 Just one side-note about the new features, beyond the OneDrive integrations all of the real-time editing requires you to standup WebApps servers (or whatever they will be called, can’t remember if they gave the new name for it) but licensing is based upon Office Pro Plus or Office Pro Plus 365 licensing. The new integration server is called Office Web Application Server (OWAS). 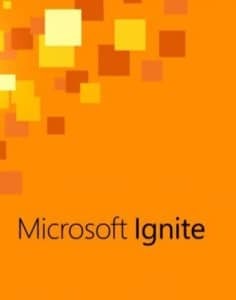 I am not sure which Ignite session it was but they stated it was a terrible acronym because of the confusion with Outlook Web App (OWA). And I’d agree. But then, what else should it be called? I understand Microsoft’s push for separating out Office Web Applications. Mostly because there was a common need between Exchange, SharePoint and other server products. Why develop the same solution several times for each individual product when you can develop a common solution once. We definitely saw a hard push for the “preferred architecture”. They even reinforced this with, ‘if you can’t do the preferred architecture you should go to Office 365’. I understand Microsoft’s view on this. For $4 per user/month you are getting a lot, including an incredibly highly available environment. But at the same time there are customers that dislike operating on a subscription model. They want CAPEX over OPEX. I get it. At the end of the day you do whatever meets your business objectives. You know your business better than Microsoft. Can’t say I have experienced any outages with Exchange Online for a few years now. BPOS had more than its fair share of problems. But since the Office 365 launch everything has been solid for me and my clients. Good for the guys(like me) who missed the ignite sessions..
Glad to be of service Bob! Haha @ David that’s one of the exact same questions i asked in one of the sessions and confirmed. =) Honestly it wasn’t a very good solution in 2010 ether. Excellent post Gareth – interesting run down on the upcoming Exchange 2016. I think its good news that Microsoft won’t be trying to make it work with Windows NLB – it was always ropey and best put to bed! Thanks David! I forgot to mention that in my post. Windows NLB is incompatible with DAGs. With the removal of the CAS role it makes it impossible to use Windows NLB going forward. Which is a very good thing!